SEE VIRTUAL TOUR FOR MORE DETAILS. Wow!! Another quality built character duplex by Spearhead Homes. Stunning finishings and layout. Private back unit. Open plan living/dining opens to South facing yard. Open granite kitchen w/ solid wood chocolate cabinetry, 3 bdrms up, plus bonus loft on top floor could be Media Room or 4th bdrm w/ 4 pc ensuite bath and outdoor deck. 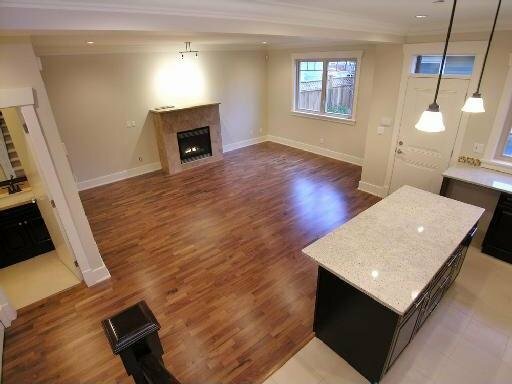 Engineered hardwood floors, extensive mouldings, warm colours, undermounted sinks and marble counters in all baths, hot water radiant heating, high efficiency hw system, gas fireplace. Gas bbq h/ups, R.I. vacuum, B.I. security. Great exterior street appeal. 2/5/10 yr Warranty. Rainscreened Hardiplank exterior, wood soffits, and much more. Immediate possession.